Mt Buller joins the Ikon Pass Global Community. Ikon Pass Now Offers Access to 39 Global Destinations – 2019/20 Ikon Pass Pricing Goes Up April 24. The enviable list of the world’s best resorts in the Ikon Pass alliance has been expanded with Mt Buller joining Thredbo in the Ikon global community. “We are thrilled to have another favourite Australian resort added to the Ikon Pass, this gives skiers and boarders the ability to shred Australia’s and the world’s best resorts” said Angus Thomson, Director of Marketing Thredbo. Only $449 AUD | 37 total days at the world’s best resorts | PLUS 50% off additional days at full Mountain Collective partner resorts. Thredbo is excited to welcome another Australian favourite, Mt Buller, to the family of world class resorts that make up The Mountain Collective – an alliance of some of the best skiing and riding destinations on the planet. This autumn the mountains are action packed with events, activities and adventures. Thredbo has so much planned for the Easter School Holidays with an experience for the whole family. It was a sunshine showdown for the third instalment of the Thredbo Super Enduro presented by Maxxis. A record field of riders, perfect mountain weather, a $25,000 prize pool and three big gravity trails made for a huge day of racing. Clouds of dust hovered above Thredbo’s trails – as over 400 riders lapped the Cannonball Downhill, Kosciuszko Flow and the All-Mountain Trail over a five hour period. There was a great mix of women and men, amateurs, pro’s, young pinners and master riders, the highly competitive masters 2 category saw close to 100 riders. After a hugely successful winter, Thredbo has stamped its mark as Australia’s top alpine tourist destination by winning the prestigious accolade of the Best Australian Ski Resort at the World Ski Awards held in Kitzbühel, Austria over the weekend. This weekend, Thredbo Mountain Bike Park opens for summer chairlift assisted gravity mountain bike riding. After an amazing winter, Thredbo is now ready to welcome an influx of mountain bikers for a massive summer of adrenaline fuelled fun. Running from November 17 to April 28, Thredbo will be a mecca for two wheeled action with the famous Kosciuszko Express chairlift ready to take riders 1,937 metres above sea level to access over 20 kilometres of gravity mountain biking trails. The trails are in great condition, with the refurbished areas packing in nicely with recent rain. The retail store is fully stocked, new top line bikes are ready for hire, there will be lessons and clinics all season long available for all levels of riders, as usual Thredbo will be looking after the après side of things with festivities, parties, giveaways and entertainment throughout the summer. Thredbo has joined hands with Jane Corben of Jindabyne Yoga Shala to host a Yoga and Wellness Retreat that will have you at nature’s heart, high in the sky amongst the breathtaking Snowy Mountains. The Retreat will see you flee the busyness of everyday and the distractions of the daily grind and immerse you in the great outdoors where you can refresh, recharge and reconnect. The Thredbo Blues Festival turns 25 this January, so organisers gathered together some of the country’s top Blues and Roots artists who will unleash their rocking and swinging tunes across the mountains 18-20 January, 2019. With $100K on the prize table, some of the world’s biggest names in the line-up and a fired up format, the 2018 Thredbo Cannonball MTB Festival 5-9 December, is set to stamp its mark as Australia’s biggest, richest and most prestigious mountain bike event. The school holidays have kicked off with amazing conditions. Now the most anticipated and fun event of the school holidays is just around the corner, the Torah Bright Mini Shred supported by Toyota in Thredbo on Sunday July 15. Torah has gathered an all-star line-up of Australian Olympians and legends to be guest coaches for the 2018 event, after inspiring us all in Pyeongchang they are sure to bring plenty to this year’s Torah Bright Mini Shred. The coaches are some of Australia’s best from the Pyeongchang including Olympic silver medallist Jarryd Hughes, Toyota Ambassador Belle Brockoff, Jess Rich, plus other Olympic legends including six time Para Olympic Gold Medallist Michael Milton, Dual Olympians Manuela Berchtold and Scott Kneller…Plus local legends including Jye Kearney, Charles Beckinsale and many others. THREDBO, NSW, June 26, 2018 – Ikon Pass, the new standard in season passes, announces Thredbo as its newest partner, now offering access to nearly 26,000 hectares (more than 64,000 acres) at 27 premier mountain destinations across the globe. The Ikon Pass is available for purchase at www.ikonpass.com and through selected travel partners. In addition to access to 26 destinations in North America, all Ikon Pass holders can enjoy skiing and riding throughout Thredbo’s 2018 winter season. Ikon Pass holders will have seven-day access to Thredbo on the Ikon Pass with no black-out dates, and five-day access on the Ikon Base Pass, with selected black-out dates. Thredbo, Australia’s premier snow destination, offers an incredible snow experience with its impressive mountain accessing 480 hectares of varied terrain and its 672 vertical meters providing the country’s longest snow runs, combined with its picturesque alpine village at the base of the mountain which creates a vibrant après atmosphere. Thredbo joins a group of North American industry leaders that make up the Ikon Pass – Alterra Mountain Company, Aspen Skiing Company, Boyne Resorts, POWDR, Jackson Hole Mountain Resort, Alta Ski Area, Snowbird, SkiBig3, Revelstoke Mountain Resort and Sugarbush Resort. Each demonstrates integrity, character and independence that is reflected in their mountains and guests. To provide the best experience possible, two pass products are available for purchase, the Ikon Pass and the Ikon Base Pass, with varying levels of access and benefits. IKON PASS: Offering unlimited access to 12 destinations plus 7-days and 7-days combined at 14 destinations with no black-out dates, for $999 USD Adult (approximately $1,345 AUD). IKON BASE PASS: Offering unlimited access to 10 destinations plus 5-days and 5-days combined at 16 destinations with blackout periods at North American and Australian destinations, for $699 USD Adult (approximately $940 AUD). The Ikon Pass is the new standard in season passes, connecting the most iconic mountains across North America and Australia, delivering authentic, memorable snow adventures. Brought to you by Alterra Mountain Company, the Ikon Pass unlocks access to a community of diverse destinations you want to ski and ride, including Aspen Snowmass, Steamboat, Winter Park Resort, Copper Mountain and Eldora in Colorado; Squaw Valley Alpine Meadows, Mammoth Mountain, June Mountain and Big Bear Mountain Resort in California; Jackson Hole Mountain Resort in Wyoming; Big Sky in Montana; Stratton, Killington and Sugarbush Resort in Vermont; Snowshoe in West Virginia; Tremblant in Quebec and Blue Mountain in Ontario, Canada; SkiBig3 in Alberta, Canada; Revelstoke Mountain Resort in British Columbia, Canada; Sunday River and Sugarloaf in Maine; Loon Mountain in New Hampshire; Deer Valley Resort, Alta and Snowbird in Utah; and Thredbo in New South Wales, Australia. Special offers are available at CMH Heli-Skiing & Summer Adventures, the world’s largest heli-skiing operation. For more information on the Ikon Pass, visit www.ikonpass.com. Alterra Mountain Company is a family of 12 iconic year-round destinations, including the world’s largest heli-ski operation, offering the Ikon Pass, the new standard in season passes. The company owns and operates a range of recreation, hospitality, real-estate development, food and beverage and retail businesses. Headquartered in Denver, Colorado with destinations across the continent, we are rooted in the spirit of the mountains and united by a passion for outdoor adventure. Alterra Mountain Company’s family of diverse playgrounds spans five U.S. states and three Canadian provinces: Steamboat and Winter Park Resort in Colorado; Squaw Valley Alpine Meadows, Mammoth Mountain, June Mountain and Big Bear Mountain Resort in California; Stratton in Vermont; Snowshoe in West Virginia; Tremblant in Quebec, Blue Mountain in Ontario; Deer Valley in Utah; and CMH Heli-Skiing & Summer Adventures in British Columbia. We honor each destination’s unique character and authenticity and celebrate the legendary adventures and enduring memories they bring to everyone. Alterra Mountain Company also owns Honua Kai Resort and Spa in Hawaii. For more information, visit www.alterramtnco.com. Record breaking snowfalls, incredible conditions, more après than ever before and now officially named Australia’s Best Ski Resort…What a way to celebrate Thredbo’s 60th season. Over the weekend Thredbo was announced as the ‘Best Australian Resort’ at the 2017 World Ski Awards™ held in Kitzbühel Austria joining a prestigious roll call of the world’s best ski resorts. The World Ski Awards are voted on by thousands of travel professionals and skiers who select their favourite resorts, chalets and hotels. They are a global initiative to recognise, reward and celebrate excellence in ski tourism, with a mission to serve as a definitive benchmark of excellence and to foster a new era of growth in ski tourism. “We were thrilled to be nominated and now ecstatic with the 2017 win, this is the second time we have won this accolade, it is testament to a great team who strive to provide guests with an exceptional experience. It’s more than just the snow, the village gives Thredbo that edge of difference, the après atmosphere, events and facilities are unrivalled in the Australian snow industry” said Jordan Rodgers, General Manager Thredbo. Earlier in the year Thredbo was also presented the award for ‘Best Australian Ski Resort’ in the prestigious Luxury Travel Magazine 2017 Gold List Awards. This is the twelfth win, cementing Thredbo’s spot in the Luxury Travel Hall of Fame. Rounding out the awards Thredbo was also voted as ‘Australia’s Best Ski Resort for 2017’ by key members in the snow industry at the Snowsports Industry Awards (SIA) held in Canberra in October. The SIA is the trade association for the snowsports equipment industry in Australia. Its members include wholesalers, importers, manufacturers, retailers, rental businesses, other trade buyers and the media. No other Australian resort has packed as much action into a season and when the season is on, like it was in 2017, Thredbo really is the place to be in winter thanks to Australia’s longest runs, variety of terrain, big vertical, epic alpine village and jam-packed events and entertainment calendar. Bring on another awesome winter in 2018. For images and vision of the recent World Ski Awards please click here. Please click here to download a copy of the press release. Biking season in Thredbo is here…. Australia’s premier mountain biking destination, Thredbo Mountain Bike Park, kicks off its season with a bang – it’s packed with promise with refreshed trails, a new bike fleet, clinics, events and special programs. Excitedly, this Saturday sees the opening of the Thredbo Mountain Bike Park this includes the Kosciuszko Express Chairlift for easy access to the top of the mountain and the feast of gravity trails. The famous Cannonball Downhill, Kosciuszko Flow Trail and All-Mountain Trail will open for riding, but with the large amounts of snow still around the higher areas of the All-Mountain Trail, riders will only have access from the mid-section to the village. “We are stoked to have all gravity trails opening for the start of the season, considering the mega winter the trail crew has done an outstanding job. With our signature events getting bigger and bigger, exciting trails changes and new fleet of bikes, this summer is stacking up to be one of the best. See you at the party Saturday” said Danny Taliana – Thredbo MTB Operations Manager. Trail masters, Dirt Art, in collaboration with the Thredbo Trail Crew, have given the tracks a makeover and are in the process of creating link trails that will connect the current routes together giving riders the option to mix up their style and type of trail over the 600m vertical decent. A favourite for Enduro riders will be the Central Spur link making its way from the All-Mountain at the top of the Gunbarrel Express chairlift across the valley to the middle slopes of the Kosciuszko Flow and Cannonball Downhill. On the lower slopes there will be a more direct access from the All-Mountain finish at Creek Station, bringing riders directly back to Valley Terminal and base of the Kosciuszko Express Chairlift. It is shaping up to be a huge opening with riders anxiously waiting six months to hit Thredbo’s gravity trails. Here’s a rundown of what to expect this weekend. The Kosciuszko Flow Trail is receiving a fairly comprehensive rebuild of a lot of the berms and features making riding the trail a lot more fluid and fun. The lower section will see things open up abit with some mild take off’s for the jump options. There will be a completely rollable line also next to the lips. The Cannonball Downhill will remain the most challenging of trails. From the rocky technical sections, riders will be welcomed with the fast and more open sections on the lower slopes. The features are carefully sculpted to be smoothly hit at speed. Look out for the monster drop in the finish area. The All Mountain Trail is looking manicured and tailor made for the rider looking for adventure. It takes you through three diverse ecosystems delivering flowing single-track, challenging rock-gardens and supreme views down the Thredbo Valley. The All-Mountain Trail will open for riding, but with the large amounts of snow still around the higher areas, riders will only have access from the mid-section to the village. The Thredbo Valley Track is one of the most talked about tracks in the region and offers a beautiful and exciting 19 kilometre ride from Thredbo following the iconic Thredbo River to Lake Crackenback Resort, with scenic undulating terrain, woodlands, forests, grasslands and impressive suspension bridges. New for summer 17/18 the 6.5km extension of the Thredbo Valley Track – this sees the track get a little more technical, still hugging along the river, you ride through all kinds of vegetation and terrain, very spectacular. Every weekend and daily throughout school holidays, morning three hour junior ride clinics will be available for children aged 10 – 15 years of age. Utilising the beginner skills park at the Valley Terminal base, the kid’s clinics include free lift access during the clinic and are designed to give young dirt demons an introduction to the trails of Thredbo in a fun and laidback environment. Riders can up their skills this summer with 2 hour beginner, intermediate and advanced clinics running daily along with 2.5hr personalised private clinics tailored to the specific needs of the rider. Thredbo MTB has two clinics on offer this summer to up skill guys and girls on the mountain. Gravity Girls is a women’s specific clinic designed to give girls a non-intimidating intro to downhill riding on the resorts gravity trails. Covering all aspects of riding, this clinic is a great way to meet other riders, build confidence and take away new skills to enhance riding in the future. Downhill Dudes is a boy’s day out on the hill with expert instructors on hand to improve riding. A nice mix of social and skills this clinic is great way to get to know Thredbo Mountain Bike Park and pick up tips along the way. This season’s event calendar will see the biggest MTB events in the country in Thredbo. High on any mountain bikers must do list is the Cannonball Mountain Bike Festival 6-10 December 2017. There’s $70,000 in cash and prizes up for grabs, five massive events across five action packed days plus a village full of entertainment – this will be big. Coming into its second year the Thredbo Super Enduro will test the true all-rounder utilising all three gravity trails, Feb 24-25. The battle of the schools continues with the 2018 Australian interschool’s MTB champs March 15-18. The Rocky Trail Entertainment State Round rolls back into Thredbo April 7-8. Whether you’re new to the sport or a seasoned pro there’s plenty of mountain biking stoke this summer in the Thredbo Mountain Bike Park. Get On Your Bike and Help Cure Cancer Snowy Ride 2017 – raising funds for research into childhood cancer. Snowy Ride 2017 – raising funds for research into childhood cancer. The idyllic Snowy Mountains will play host to over 2,000 motorbike riders November 4th as the 17th annual Snowy Ride rolls through the mountains to raise funds for vital research into a cure for childhood cancer. The Thredbo Cannonball MTB Festival, Australia’s biggest and richest mountain bike event, celebrates five massive years in 2017 and with a packed program of gravity events and non- stop entertainment, this year’s event, 6-10 December, promises to be the biggest and the best yet. The famous event, twice ranked Australia’s best event by the MTBA will see amateurs, rising stars and the world’s best descend on Thredbo for five days of dirt defying action and the chance to take home their share of a whopping $70k in cash and prizes. This is the biggest prize purse ever seen at an Australian gravity inspired event. The five mega events are set to showcase the diverse terrain on offer in the Snowy Mountains, and highlight why Thredbo is Australia’s home of gravity mountain biking. There’s something for all styles of MTB riding, with the festival attracting riders of all levels in a mix of events including the prestigious wearelusty Australian Open Downhill, Canyon Flow Motion Cup, Maxxis All Mountain Assault, SRAM Whip Wars Big Air and the RockShox Pump Track Challenge on the Village Green. There’s over 15 categories in each event, so no excuses – the Cannonball Festival caters to all and is a great introduction to the growing popularity of mountain bike competitions, just choose an event that aligns with your skill and ability. Participation across all events is crucial for the pro field as these riders will have the chance to be crowned King or Queen of Cannonball. Points scored across each event will determine this factor. The weekend offers just as much action off the trails as on them, with both sides of the resort pumping during the iconic mountain biking celebration. Thredbo’s famous village will play host to an awesome line-up of DJ’s and live gigs with the region’s stellar offering of bars and restaurants also open. A massive prize pool, a roll call of big names and some of the best gravity tracks in the country, the Cannonball Festival is one not to be missed. Event registrations are now open with a 15% early bird competitor discount for those signing up before midnight 31 October 2017. Click here to register now. Visit thredbo.com.au/cannonballfestival for full event details. To get a taste of all the action from last year’s event click here for the full event recap. All promotional images, video and artwork for the 2017 Cannonball MTB Festival are located here. Feel free to use across your various channels. The wearelusty Australian Open DH will be raced on Thredbo’s famous Cannonball Downhill Trail the old school way, meaning we will include the upper fast and furious summer road. Riders will then be thrown into a technical masterpiece comprising of rocky chutes, features that launch and fast open sections with speeds not dis similar to those found on a World Cup course. This event also boasts the biggest pay day for a DH race in Australia. New to this year’s main event will be a seeding day for all categories which will go down on Friday 8th Dec. This will give riders a chance to see where they stand among the rest of the field, before heading back up to the start gate on Sunday Dec 10th for downhill finals. Saturday morning will see the Canyon Flow Motion Cup go down on Thredbo’s famous 5km Kosciuszko Flow Trail. Although not super technical, this race requires a fit efficient type of rider. A stack of steep banked berms and rolling traverses ensures that cornering and pedalling ability will be paramount. The Flow Motion Cup is also a great introduction to gravity racing. The crowd pleasing SRAM Whip Wars will again hit centre stage Saturday afternoon, with some of the best mountain bikers from different genres sending it sideways on the super booter at the finish arena. The biggest sideways whip bought back will take the honours. A crowd pleasing trick will also fill your pockets with cash. Get ready for the ROCKSHOX Pump Track Challenge, see Thredbo’s Pump Track in full flight as the smooth momentum masters set the perfectly sculpted course on fire. A test of ultimate skill and stamina, as riders pump, double and manual around the 2-3 lap course without a single pedal stroke. Maxxis All-Mountain Assault | Thursday 7 December The Maxxis All-Mountain Assault returns to 1800m above sea level at the top of the Gunbarrel Express Chairlift. The iron men and women of mountain biking will embark on a gruelling 7km undulating descend on a trail designed for a short travel mountain bike with times around 13 minutes to aim for. The All-Mountain trail has everything a rounded rider could ask for, technical descends, natural obstacles, smaller jump options and pinch climbs to push even the most avid enduro purist. Springtime in the mountains is a cheeky little pocket of fun on the Australian alpine calendar. With a massive line-up of events, sunny weather and great conditions – this September in the mountains is shaping up to be one of the best. The 2017 winter snowfall totals eclipsed 300cm’s this week and with very cold temperatures, visitors are raving about the snow quality and trail coverage. The Snowy Hydro snow depth recorded at Spencers Creek 24th August was 185cm, the highest recorded depth since 2013. To celebrate the incredible snow conditions Thredbo has just launched its 2018 Season Pass Sale…offering skiers & snowboarders the ultimate in flexibility, choice and savings with a winter only 2018 Season Pass or the Thredbo 365 Pass that includes winter, summer and Mountain Collective benefits around the world. Winter enthusiasts can secure their ideal pass and a lowest price guarantee by purchasing by Sept 1 with a small $49 deposit. Enjoy unlimited skiing & snowboarding at Thredbo all winter long with the 2018 Winter Season Pass for only $749. It’s the perfect pass for those who want to get the most out of the season at the lowest price. If you skied or snowboarded more than 6 days this season and plan to do the same next season then this pass is the best option. This is the ultimate pass for the ultimate mountain. The best thing about the Thredbo 365 Pass (17/18) is that it is valid for 12 months giving you unlimited summer 17/18 (including mountain biking), winter 2018 lift access, Thredbo Leisure Centre access and 50% off all Mountain Collective partner resorts. It’s unbelievable value for year-round Thredbo access and global benefits for only $849. Mountain Collective™ Resorts include Aspen Snowmass, Jackson Hole Mountain Resort, Mammoth Mountain, Alta Ski Area, Banff Sunshine, Coronet Peak & The Remarkables, Lake Louise Ski Resort, Revelstoke Mountain Resort, Snowbasin Resort, Snowbird, Squaw Valley Alpine Meadows, Sugarbush, Sun Valley, Taos Ski Valley & Telluride Ski Resort. Plus you receive 50% off up to 5 days at each of the 4 Mountain Collective Global Affiliate resorts which include Hakuba Valley and Niseko United in Japan, Valle Nevado in Chile and Chamonix Mont-Blanc in France. Australia’s longest downhill race, the 26th Thredbo GH Mumm Top2Bottom, was run and won in challenging conditions today. The forecast cold front delivered Thredbo the biggest snowfall of the season so far with more snow expected over the next couple of days. “Seeing the talent level of these little Aussie shredders was amazing…It was awesome to share advice, tips and the stoke with all the kids and have snow flurries falling all day long…absolutely magical” said Torah Bright. Toyota One Hit Wonder Mountain Festival 2017: The world’s best skiing, snowboarding, après and air time! The Toyota One Hit Wonder Mountain Festival is taking over Thredbo again from Tuesday the 5th of September through to Saturday the 9th and is set to be one huge week of high flying action! This year, snowboarding has been thrown back into the mix, allowing for the world’s best to push the benchmark of what’s possible to pull off in the air…we can’t wait. The Toyota One Hit Wonder Mountain Festival boasts the biggest jump in the Southern Hemisphere, averaging at just over 100ft, the world’s best skiers and snowboarders put their skills to the test and bodies on the line, as they battle it out for their chance at the $20k prize purse that’s up for grabs. With the winter Olympics just around the corner, athletes will be pushing the limits on this year’s jump to put them at the forefront of skiing and snowboarding progression. The competition side of the event consists of a big air session for both skiers and snowboarders followed by a newly introduced challenge, The GoPro Team Challenge. Each randomly drawn team of pro skiers and snowboarders will be handed a bag of GoPro cameras and mounts with 24 hours to session the jump to their heart’s content and upload a 60 second clip. All the clips will be published online and then it’s up to the public to vote for their favourite clip, ultimately deciding the One Hit Wonder GoPro Challenge winners. Although now in its ninth year running, snowboarders haven’t officially competed in the Toyota One Hit Wonder Big Air since 2010. “In a time when competition is often criticized for producing podium runs that are barely distinguishable between one another, it’s an incredible feat for Australia to now have one of the only snowboard events with a jump big enough to actually push the global benchmark of Big Air tricks.” -Richard Hegarty, Snowboard Director. “We are very excited to build a jump feature that caters for both disciplines. It’s twice as much fun for both the riders and the crowd having everyone up at the top of Thredbo in perfect Spring conditions showcasing what the world’s best can do, especially ahead of an Olympic season.” -Timothy Myers, Media Director. The best thing about this years One Hit Wonder is that it’s an insight into what we could expect to see from the South Korean stadium-based Olympics next February. The athletes however aren’t in the air for the entire week, they, just like the rest of us, like to indulge in post event celebrations and après, so Thredbo’s putting on some huge live concerts and entertainment to accompany the high flying action. On Wednesday the 6th of September in the Keller Bar, Thredbo is throwing a Full Moon Party for all guests, spectators and athletes to enjoy…get ready to howl under the moon! Following the final day of competition on Saturday the 9th of September, First Base is putting on a party at Poolside to keep the good times going. Enjoy your afternoon après with help from Hugo Gruzman (Flight Facilities), Tom Tilley (Triple J) and Luke Million as they play sweet tunes into the night. Following on from First Base at 6pm is the final Heineken Village Concert Series, make sure you save some energy for this one, as Strange Associates, Panama and Winston Surfshit take over the village for some spring après celebrations. Young shredders are invited to big day out in Thredbo, riding with the Olympic gold and silver medallist Torah Bright and her snow pro friends at the Torah Bright Mini Shred. New for winter 2017, record label Falcona and Canadian Club have teamed up with Thredbo to bring together two of Australia’s hottest DJ’s to create, First Base, the best thing that’s happened to the après snow scene since fluorescent one pieces, a fitting tribute to Thredbo’s 60th anniversary. Hugo Gruzman from Flight Facilities and Triple J’s Tom Tilley are the dynamic duo that is, First Base and their goal is to keep the good vibes flowing after a big day of skiing and boarding with their nostalgic throwback DJ tunes. First Base is sure to take you back to the early 80’s and set the tone for a great night on the town. Tom and Hugo are bringing along some of their friends to the party, who also happen to be some of Australia’s best artists of the moment. Luke Million, Hayden James and Confidence Man are all joining in on the fun and are sure to keep the good vibes going into the night. So make sure to leave some energy for the First Base poolside parties after a big day on the slopes, as it will be a highlight of Thredbo’s event calendar this winter. The Thredbo G.H. Mumm Race Weekend returns to Thredbo and it promises to be the party of the season with fast paced action both and off the slopes. In the village there is a massive roll call of DJ’s, set to play in mini festival atmosphere at the base of the mountain. Headlining is Sydney’s Jesse Porsches, who after teaming up with some of Australia’s top artists is breaking out solo, so expect a sneak peek of his debut single. Also playing across the weekend is electronica dance DJ Elizabeth Rose, Moza, Commandeur and KLP. On the mountain – slip into your speed suit and wax up as Saturday sees the iconic Top to Bottom downhill race, that has over $20,000 in cash and prizes up for grabs. The Top to Bottom sees skiers and snowboarders battle it out for on-snow supremacy as they conquer Australia’s longest, fastest and most iconic downhill snow race. Some race to win, some for the experience and some to tick it off their snow bucket list but the exhilaration and free champagne at the finish make it a must do. The race starts as the sun peeks over the horizon to allow competitors to use the full width and length of the Supertrail. Riders line up at the top of the 3.2 kilometre course with their skis and boards in hand and run to launch line where they strap and click in for a fast-paced blast to the bottom. This is where the battle begins as riders head to the village below, dropping 600 vertical metres navigating, gates, straights and other racers – it’s adrenalin packed action. The event draws everyday heroes as well as past and current Olympians including Scott Kneller and Thredbo snow ambassador, Torah Bright, who will both be competing in this year’s race. Top2Bottom features seven categories including pro, women’s, amateur and veterans. The Thredbo Top2Bottom is Australia’s longest, fastest and most iconic downhill snow race. Some race to win, some for the experience and some to tick it off their snow bucket list but the exhilaration and free champagne at the finish make it a must do. The Thredbo Village Concert Series is back again for 2017 thanks to Heineken. The Thredbo Village Square will play host to the concert series, where snow going music lovers can slide off the slopes and into an amazing line-up of Australia’s best music acts and pop-up Heineken bars. The concerts are for all-ages and free of charge with free buses running from Jindabyne, that can be booked via the Thredbo eStore. Enjoy some great tunes after a big day of skiing and snowboarding the mountain…the perfect way to end your day. You must be in Thredbo July 29 as Hot Dub Time Machine hit the stage for concert two of the Heineken Concert Series. Hot Tub Time Machine is the World’s First Time Travelling Dance Party, taking festivals, theatres, rooftops and venues all over the world on a transcendent dance through pop music history and now they are heading to Thredbo to shake up the Village Square. Their Songs are played in “strict” chronological order from 1954 to 2015 with enormous mashed visuals all scratched live from vinyl turntables. Created and performed by DJ Tom Loud Hot Dub is all about singing, dancing and having the best, party, ever – a perfect fit for Thredbo. What a way to swing into spring with Winston Surfshirt and Panama playing up a storm in the Village Square wrapping up the Thredbo Heineken Series. The six piece Winston Surfshirt’s unmistakable sound is a unique blend of soul and hip hop – they say it is the auditory equivalent of A Tribe Called Quest splitting spliffs with your parent’s favourite band. Over the past few years, Winston Surfshirt have become vital members of Sydney’s underground live scene, with past performances ranging from sold out headline shows to festival appearances, warehouse gigs and block parties. In 2016 Winston teamed up with label buddies Polographia providing the buttery vocals for their triple j and Majestic Casual approved track “Sly”. They have turned it up a notch in their recently released their new single “Ali D”, the new sound will be winning crowds over everywhere in coming months and in Thredbo come September. Popular five piece band Panama round out a solid double up of bands, with the distinct sounds of lead singer Jarrah McCleary sure to impress the Thredbo crowds. They call it the days of days for snowboarders, etched from history the Transfer Banked Slalom in Thredbo has carved itself into a highlight of the Australian winter. The event embodies the very essence of snowboarding, with the Thredbo event bringing together the snowboard community – the old shredders showing the young guns old school moves while the fit and fearless float effortlessly through the carefully crafted course. Consisting of berms, turns and jumps riders need to bring their A game to manoeuvre the technical but fun course to cross the line. Features such as Galina’s Gully, a sweeping section, natural half pipe and a wall ride are sure to test riders on the day. If there any tip to offer to get you over the line with a chance…wax that board and hold on. The good times don’t stop on your last turn, Saturday night head to Poolside at the Thredbo Alpine Hotel where Client Liaison fresh off a sold out national tour will take over the party. From the studio to the top end of town, Client Liaison’s sound plays out like a long lunch followed by a round of cocktails, a definite Thredbo crowd favourite. The Transfer Banked Slalom is one event the guys at the establishment will never be able to get their hands on, so leave the competitive hunger at home and replace it with an 80’s inspired après outfit and a big smile. So what do you need to do now in order of priority to attend the Transfer Banked Slalom? Our favourite season is here! And to help celebrate and get everyone stoked for a big winter ahead we have just released the 3rd instalment of our Thredbo, 60 years of stoke series….The Next Generation…with Torah Bright. In this video we take a look at Thredbo in the 90s/2000s/Today through the eyes of Thredbo Ambassador and Olympic Gold Medallist Torah Bright. Torah takes us on her journey from her first days on snow at Friday Flat, to winning Olympic Gold and now inspiring the next generation. Watch as Torah throws back to the early 90’s where snowboard legend Terje Haakonsen competed at the Coke Classic alongside Thredbo locals, how the Olympic torch made its way through Thredbo for the 2000 Sydney Olympics and how Torah now shares her love of snowboarding and Thredbo with her family, friends and future generations. Below are all the assets if you wish to feature. School holidays are here and excitedly Thredbo has teamed up with LEGO to host the LEGO Friends Snow Festival July 1-15. The fun takes kids onto the mountain for their very own snow hunt, where they need to help the LEGO Friends stars Stephanie, Olivia, Emma, Mia and Andrea find their skis and snowboard hidden at secret locations on the mountain. Then it’s time for creating après magic in the LEGO Friends Play Zone where the kids can build and bring Heartlake City to life. Thredbo Jazz is turning 30 and the 2017 festival is set to be one to remember with a big celebration of the best in Australian Jazz and Roots Music on the rooftop of Australia. Thredbo will be swinging April 28- 30 as this year’s line-up is outstanding and is sure to delight lovers of all jazz genres. Lisa Hunt and Forever Soul will make a debut appearance in Thredbo with Lisa’s extraordinary voice setting the soul free for some late night partying. Australian Jazz Legend Bob Barnard is back with the Barnard Family Jazz Band and for more dancing than a cuban conga line Chukale is bringing the Latin Big Band back to the village. Thredbo crowd favourites the Kirrawee High Band return with their youthful energy and prodigious talent and for lovers of modern improvisation the Matt McMahon Trio will weave their spontaneous spell. Some fresh faces to the Thredbo Jazz program – traditional Jazz Fans will love the Thredbo debut of the Unity Hall JazzBand along with Mikelangelo and the Black Sea Gentleman who will bring their Baltic bravado and good times to town. A must see is Gregg Arthur who is reviving Nat King Cole and the dinner suit. Thredbo regulars George Washingmachine, Liza Ohlback and Lionel Robinson are sure to wow the crowds. The festival program will see 17 bands playing in a variety of venues from the village to the top of the mountain, so festival goers can catch performers in different settings across the weekend. New trails and perfect weather welcome a record number of riders for opening weekend of the mountain bike season. 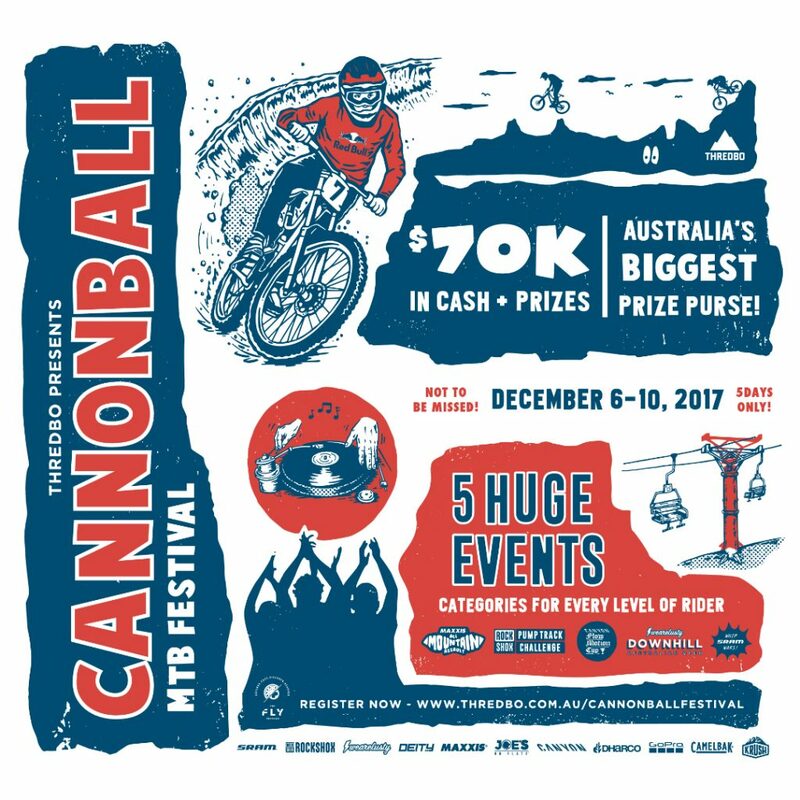 The richest and most exciting event on the Australian mountain bike calendar, the Thredbo Cannonball Festival, is back with a fresh line-up of events and entertainment plus a massive prize purse of $50,000 up for grabs. The mountain will be alight 8-11 December 2016, as amateurs, rising stars and the world’s best descend on Thredbo for four days of non-stop gravity action. There’s plenty on the line as riders hit the tracks for their chance to take home their share of the cash and prizes and the prestige of being placed top of the podium. Thredbo, high in the Snowy Mountains, is set to transform into a Blues town come 20—22 January 2017, as some of Australia’s best and Internationally acclaimed artists play the Thredbo Blues Festival over three big days and nights. The 23rd annual Festival is a celebration of the best in Australian Blues. Home grown blues guitar prodigy James Southwell is back with a power house band including Atlanta (USA) bassist extraordinaire Charlie Wooton. Jeff Lang with tabla player Bobby Singh is set to take audiences on an eastern blues journey. The Foreday Riders return to Thredbo for their 50th anniversary as one of Australia’s best blues outfits. Other music legends on the program include Kevin Borich, Phil Manning, Mal Eastick, Mick Pealing and Nick Charles and crowd favourite Ray Beadle performs his solo show. With an incredible line-up of music, an easy to get around village and unique venues – this Festival is a standout amongst Blues lovers. All venues are within easy strolling distance from the village centre and they range from intimate bars and dining settings, big band concert style, outdoor Poolside performances to shows at the top of the chairlift, some 2000m above sea level.